LANSING (JULY 26, 2018) — A state senator introduced a bill in 2017 to combat gun violence. The bill also could have benefited a company the lawmaker worked for just before he won a seat in the Legislature in 2016. The bill from Sen. Ian Conyers, a Democrat from Detroit, would have set up a grant program for “law enforcement technology.” Representatives from the California technology company ShotSpotter voiced support for the bill in a Senate committee. According to a new disclosure filed by Conyers, he had done work for ShotSpotter before joining the Legislature. 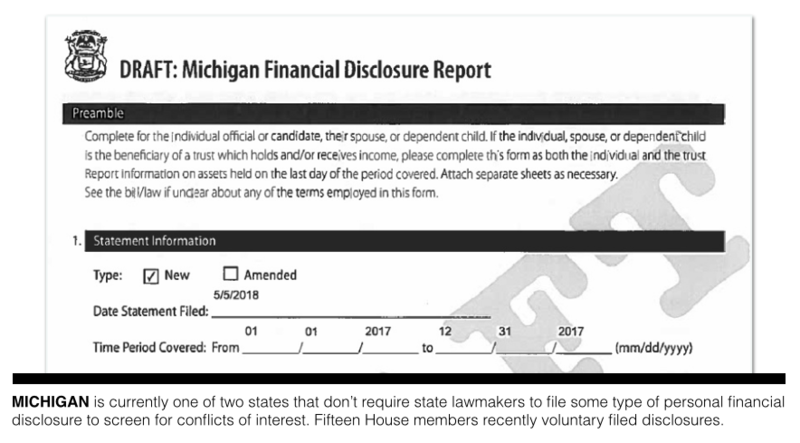 Because Michigan is one of just two states that don’t require state lawmakers to disclose information about their financial interests, connections like this one can go undetected. However, this summer, the public is getting some unusual insight into lawmakers’ financial dealings. Fifteen state House Democrats made voluntary disclosures about their finances, and a handful of other lawmakers are running for Congress, which requires candidates to file financial disclosures. Currently, 18 sitting state lawmakers — about 12 percent of the Legislature — have made some level of personal financial disclosure this year. The voluntary disclosure forms used by the Democrats ask for general information about the names of organizations and companies connected to lawmakers. But candidates for the U.S. House have to file more detailed disclosures about their investments, their income and any compensation over $5,000 they’ve received in recent years. A consortium of media outlets, including the Michigan Campaign Finance Network, Fox 2 Detroit, Gongwer News Service and WDET, Detroit Public Radio, has been digging through the financial disclosures filed this year by candidates for Congress and will be reporting on some of its findings. One of the candidates for the U.S. House is Ian Conyers, who is currently a state senator representing Detroit. On his personal financial disclosure filed with the clerk of the U.S. House earlier this month, Conyers revealed that he had received at least $5,000 in compensation in the last three years from a California company called ShotSpotter for social media work. The company describes itself as “the global leader in gunfire detection and location technology.” The company’s technology uses acoustic sensors to locate illegal gunfire and alerts police, according to its website. Representatives for the company even testified in support of Conyers’ bill in a Senate committee in May 2017. “I believe that giving our officer response time and identification advantage with real location data would not only help them but would help rebuild the public trust in our public safety institutions,” Conyers said during that meeting. A spokesperson for ShotSpotter declined to comment on this story, saying the company doesn’t comment on human resources matters. Asked about his past work for ShotSpotter, Conyers told Fox 2 Detroit’s M.L. Elrick that he didn’t see the situation as a conflict because the bill simply set up a grant program under the Michigan State Police and didn’t specifically appropriate money for any company. Conyers also noted that he stopped working for ShotSpotter in 2016 before joining the Legislature. Conyers said he did social media work for ShotSpotter and was paid about $1,000 a month as a contractor in 2016 before he joined the Legislature at the end of the year. His total compensation from ShotSpotter was between $10,000 and $12,000, he estimated. Conyers also hasn’t completely hidden his connections to ShotSpotter. 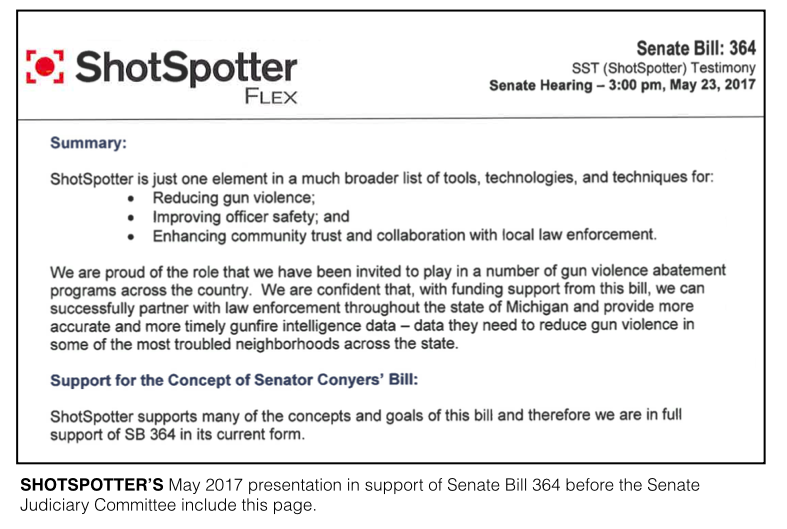 As a candidate for the state Senate in 2016, Conyers referenced professional work for ShotSpotter in response to campaign criticism concerning his stances on gun policy. Conyers told Elrick that even before he got to Lansing, he was concerned about shootings and gun violence. “That bill came from first-hand experience seeing what needed to be done in Detroit,” he said. Senate Judiciary Chairman Rick Jones, a Republican from Grand Ledge, said he was unaware Conyers had received compensation from ShotSpotter. Jones said Conyers brought up the bill, and Jones said he didn’t oppose the idea. Jones originally planned to advance the bill to the full Senate. But some Republicans on the Judiciary Committee spoke out against it because of privacy concerns regarding the acoustic sensors so the bill didn’t have enough support to advance. In addition to Conyers, state Rep. Tim Greimel, a Democrat from Auburn Hills, state Sen. Coleman Young, a Democrat from Detroit, and state Rep. Klint Kesto, a Republican from Commerce Township, are also running for the U.S. House and have filed financial disclosures. 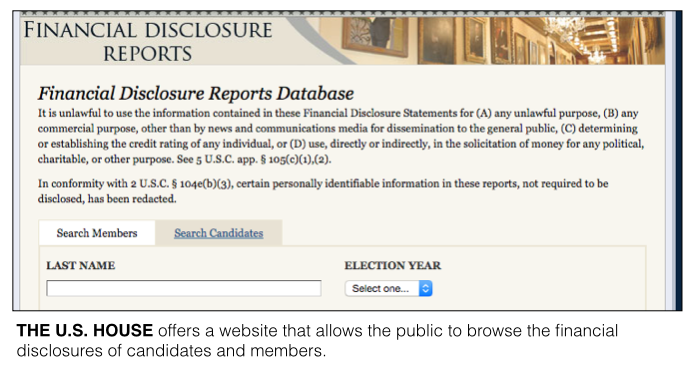 You can access their disclosures and the disclosures of other U.S. House candidates through this link: http://clerk.house.gov/public_disc/financial-search.aspx. Another state lawmaker, Sen. Mike Kowall, a Republican from White Lake, is running for the U.S. House but hadn’t filed his disclosure as of Wednesday. Earlier this week, Kowall said that he was in the process of filling out his disclosure. The forms are generally due May 15. Without a deadline, a group of 15 state House Democrats, including Greimel, voluntarily released disclosures about their finances earlier this month. Those disclosures can be found at this link. Only one of the 15 lawmakers who filed voluntary forms disclosed having employment income of over $5,000 in 2017 from a source other than the state of Michigan. That lawmaker is state Rep. Tenisha Yancey, a Democrat from Detroit, who also has a legal practice, according to her form. The voluntary forms asked lawmakers to disclose any relatives who are lobbyists. None of the 15 lawmakers disclosed being related to a lobbyist. Rep. David LaGrand, a Democrat from Grand Rapids, has been leading the push for increased financial disclosure in the Legislature to prevent conflicts of interest. In a 2016 investigation by MCFN and Bridge Magazine about potential conflicts of interest in Lansing, LaGrand said he didn’t think many lawmakers were familiar with the issue. Bills to institute financial disclosures for lawmakers passed the state House during the 2007-2008 session and the 2009-2010 session. They went on to die in the state Senate. Opponents of the reform have argued that the disclosures could keep some individuals with either very small amounts of assets or large amounts of assets from running for office. Michigan and Idaho are the only two states that don’t require some level of financial disclosure from lawmakers. Michigan Senate rules say senators shouldn’t vote on bills in which they have “a personal, private, or professional interest.” Michigan House rules allow members to voluntarily abstain from voting if they believe they have a conflict of interest.